I recently came across Jim Rohn, and quickly realized that the genius behind his work originating in the 60’s, 70’s very much applies to the world of tech startups. 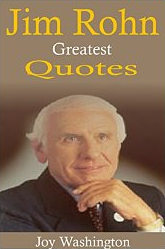 Emanuel James “Jim” Rohn (September 17, 1930 – December 5, 2009) was an American entrepreneur, author and motivational speaker. Over his 40+ year career, Jim wrote 17 books. I was so eager for the quick version of his wisdom, so I found this short book of 400 of his Greatest Quotes on Kindle for 99 cents. Suffice to say, it was the best 99 cents I ever spent on anything since chewing gum. I devoured the book in a few minutes, and was puzzled to find numerous quotes that had a direct relationship to a startup’s life. Not only that, I immediately sent the e-book as an e-gift to about ten entrepreneurs I’m currently working with, or invested in their companies, with a short note: “Everything you need to know about success is in this book.” That was the best $10 I spent. And as an experiment, I asked them if they would share with me which were the top 2 quotes that stuck with them the most, in terms of actionability. So, I’ve chosen 34 quotes from the 400 in that book, to illustrate not only the fact that Jim Rohn was probably the original startup mentor, but to show that we don’t have to re-invent everything in the world of startup management. Starting, funding, growing, and scaling a startup requires a lot of common sense and wisdom that is already available for the picking. If you learn and believe in some basic business and life philosophies, you can use your common sense to automatically apply them, and you will often find the answers yourself. Here are the key quotes that I liked, and a quick comment on the startup analogy. If this doesn’t sound like Growth Hacking 101, I’m not sure what does. This is exactly what growth metrics and startup analytics enable you to find out. Good thing we can have that in real-time today, and in digital form. It used to all be on paper before. Yes, the genesis of a startup is always that magical idea. But ideas are only the beginning. You need to pad these ideas, and execute on them. You can’t fool the market, just in case you were thinking about getting away with it. It takes a while to build a viable company. Be confident, and keep strengthening your success base, one layer at a time. An entrepreneur who doesn’t grow, develop and mature along their startup’s evolution eventually becomes a liability to its growth. If this isn’t Customer Success 101, or Customer Advocacy basics, I’m not sure there would be a simpler way to say that satisfied customers will refer new customers back to you. Our modern interpretation is “nail it before you scale it.”. Once you figure out that skill, you can transfer it to others and scale that way. Another basic rule of sales is to have a large funnel. Sales numbers speak. If you hit your numbers, nobody will say you were a bad salesperson. A similar adage is “bought, not sold”. It applies two ways: 1) Ideally, let VCs approach you, instead of you going after them, b) Strive for market pull so that customers and users come to you, and you’re not pushing yourself on them. Financial independence means you may not require further venture money to fund your growth. You need to have a plan or strategy, and executing on that will lead you to success. If you cannot communicate with clarity, you cannot touch people or the market around you. It starts with your venture funding pitch, passes by your market and customers, and includes your employees. Be authentic and truthful, with your numbers and your statements. What a powerful statement. Just think about it during moments of difficulty. Don’t show or acknowledge your company weaknesses in the marketplace. Your image as a company and as a person determine who you end-up working with, from VCs to employees to customers. Beware of employees that complain without suggesting how to solve an issue. “Good people are found, not changed. Recently, I read a headline that said, “We don’t teach our people to be nice. We simply hire nice people.” Wow! What a clever shortcut.” – Jim RohnThat’s a great human resources practice: hire people that are smart, work hard and are nice people. That’s it. The rest will take care of itself. It’s all about people. And that applies to your employees most importantly. Especially so true for remote teams. This is exactly how Matt Mullenweg, CEO of WordPress/Automattic describes his philosophy for running a decentralized organization where his employees are in several countries around the world. Easier said than done, but Jim Rohn has just summed-up the key management leadership qualities. Read it as “market leadership” too. Unicorns, anyone? The percentage of startups that succeed, change markets and inspire others is very small. Be that one. Jim Rohn was probably the originator of the rule of 3 Why’s? Ask Why 3 times, and you typically get to the bottom of the answer. So true. Failure doesn’t happen overnight, just as success doesn’t either. Get regular check-ups with advisors and board members, so you don’t accumulate error debt. Immediately recognize what the data is telling you, and if you need to change direction, do it. There are many paths to reach your destination. Startups operate in dog years. It’s a fast-paced environment. The more decisions you make, the more you make great ones. I haven’t met a successful entrepreneur that wasn’t curious and obsessed about their curiosity. Sailing 101. You set your sails according to the direction you want to be headed in, regardless of the wind’s direction. Interpretation: make internal adjustments to keep going forward. If the wind changes direction, just change the set of the sails. A startup has to break new ground every day, decisively. If you prefer being cautious, get a corporate job. Ah, the old crunch time. A startup is not a university exam where you can have a sleepless night and still get an A. If your startup doesn’t deliver value to the market, there is no way you will have a valuable startup. I like to see startups apply this philosophy to budget allocation after receiving funding. I like them to think that every dollar spent is an investment they are making, instead of an expense they are incurring. This applies to salary levels as well. Before paying more just because you can afford to, ask yourself whether you are always getting back more than what you are paying for. Revenues! If you have revenues, you are less dependent on outside venture capital to survive, but you can ask for it to grow, instead. From now on, I’m going to take a more philosophical and indirect approach to coaching/mentoring startups and entrepreneurs. Truth is, as Andy Weissman pointed out, there is a Chaos Theory of Startups. In the same way that every venture capital deal is different, every startup will be different, and that chaos theory is so very true at the beginning, but as the company grows, some of that chaos turns into patterns, and it gets a little easier to manage with less ambiguity. At the end of the day, it is the entrepreneur/startup who has to score every goal, not the coach. As an advisor/investor, all you can do is help to make them self-aware, and it will pay dividends as they’ll realize how to improve themselves and solve the challenges they will face.